Duxbury players celebrated after winning a state title. Myette will graduate with four state championships, three in Division 2 and one this winter in Division 1. A three-time All-Scholastic, she posted 11 shutouts and had a 0.75 goals against average. The captain has led the state in goaltending the past four years. She will attend Quinnipiac. Led by this two-time All-Scholastic, AC won the Catholic Central title, finished 19-3-2, and earned a berth in the Division 1 state final. Rossini finished with 30 goals and 15 assists. The three-time CCL All-Star has 64 goals and 45 assists in her career. The junior center can light up a scoreboard. Conway had 66 goals this season, a state single-season record. A two-time All-Scholastic, Conway had a school-record seven goals in a game and with a year to go she has 118 career goals. She also plays softball. The two-time Globe All-Scholastic ends her high school hockey career as one of six girls in state history to have recorded 300 or more points. The four-time GEMIHL All-Conference forward finished her season with 31 goals and 17 assists. The senior also received high honors. The Hobey Baker Award recipient and two-time team defensive MVP started her career with the Harbormen by winning the Division 1 state title in 2011. The SEMGHL All-Star collected a career-best 26 points this winter. A Shriner’s Hockey Classic All-Star, she also plays field hockey and golf. The Northeastern Hockey League MVP had 30 goals and 40 assists this winter to finish her career with 84 goals and 85 assists. The three-sport athlete was selected to the Shriners All-Star Classic and for the Boston Bruins/MIAA Sportsmanship Award. She’ll play field hockey at Louisville. On a team loaded with offensive talent, the sophomore forward stood out this season, recording 23 goals and 32 assists and joining with co-MVP Kaitlin Hoang to lead the Colonials to an undefeated season in MVC/DCL play and a 21-3 overall mark. The two-time All-Scholastic goaltender managed a 1.14 goals against average this season with nine shutouts. The senior also plays softball where she was the MVP of the league and a three-time Middlesex All-Star. The Southern Maine commit will play collegiate softball and hockey. The two-time Bay State All-Star notched 43 points this season to captain the Raiders to the Division 2 state finals. The three-sport athlete was captain of the soccer team and she plays lacrosse. Docktor competes with Charles River girls’ hockey and Mass Elite lacrosse. The forward pioneered a 16-2-5 season en route to the Wolverines’ first-ever Division 2 state title. The SEMGHL West All-Star amassed 53 goals and 66 assists in her career. The three-sport athlete plays lacrosse and soccer and has committed to the University of Richmond. The SEMGHL All-Star scored the game-winner against AC for the Dragons first-ever Division 1 state championship. She finished the winter with 28 points. A two-time Division 2 state champion, the junior also plays for the Baystate Breakers. An honor roll student, she also plays lacrosse. The Clippers have rapidly become one of the state’s elite programs thanks in part to this talented forward. Haberl finished the winter with 22 goals and 13 assists giving her 79 career points. Also a talented field hockey player, she’s a three-time ACL All-Star in the fall. The senior forward was named ISL and New England Player of the Year. An Under-18 USA Women’s National Team member, Laing had 31 goals and 20 assists in leading Nobles to a 21-1-1 season and a trip to the NEPSAC Divsion 1 final. Layo finished her senior year as her school’s all-time leading scorer with 218 points (8 goals, 138 assists). Along the way she set a state record for assists with 49. Layo is a two-time SEMGHL All-Star and was also a Shriners All-Star selection. She will attend Endicott. The junior forward led the Raiders (17-3-2) with 40 goals and 14 assists. The team co-captain and two-time Middlesex League Freedom MVP was one of the top 10 scorers in the state. She was also a field hockey All-Scholastic in the fall. The Middlesex League MVP led the Rockets in scoring with 20 goals and 21 assists to clinch a postseason ticket. The sophomore center and two-time Middlesex All-Star led Reading to a 14-4-3 record. The honor roll student also plays varsity softball. A four-year member of Milbrook’s team, Sheeran set the school’s career and season scoring records and finished her career with a 36-goal 15-assist campaign in 22 games. She was named New England DII Player of the Year and All-New England first team. The Catholic Central MVP registered a .940 save percentage and six shutouts this season while posting a career-best 1.42 goals against average. The three-year starter led St. Mary’s to back-to-back Division 1 state finals, which the Spartans won in 2013. She also plays lacrosse. St. Paul’s captain had 32 goals and 25 assists this winter to end her career with 81 goals and 92 assists. She had eight game-winning goals this winter and has 18 for her career. Those numbers earned her ISL co-MVP honors. She’ll attend RPI. After scoring 24 goals and adding 10 assists this season, Witwicki was named EIL MVP. The center and two-year captain finished her career with 124 points (71 goals, 53 assists) and led Pingree to the 2013 EIL title. She’s also and EIL All-Star in field hockey and softball. The two-time Globe Coach of the Year proved his team can handle any division after clinching their first Division 1 state championship and fourth straight title overall. In 13 years his career record is 176-72-29, including this year’s 17-1-6 mark. Westwood went from a seven-win team four years ago to a state champion this winter. 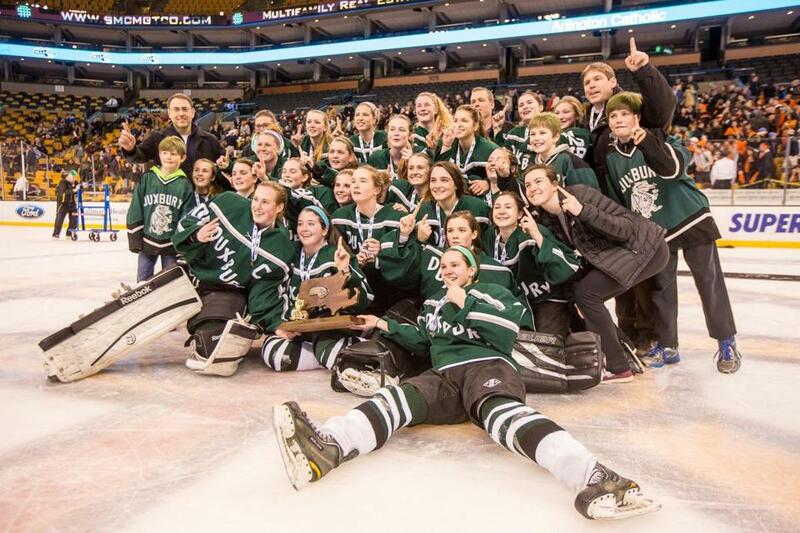 The Wolverines went 16-2-5 and won the Division 2 state title, beating Wellesley. The Holliston High grad is 30-9-9 in his two years as head coach. Bay State — Braintree: Madison Kingston, Haley Payne. Dedham: Samantha Girard. Framingham: Abby Bogovich, Ashley Castriotta, Cassie McKinnon. Milton: Kaitlin Gately. Natick: Lexi Harvey, Alyssa Lilly, Hayley O’Loughlin. Needham: Katie Belval. Newton North: Hannah Gallogly, Caitlin O’Hanley. Norwood: Shannon Gillis, Kacie Smith. Wellesley: Keely Corscadden, Cecily Docktor, Sarah Goss, Meghan King. Catholic Central — Archbishop Williams: Katie Barry, Kiera Dwyer, Michelle Monet. Arlington Catholic: Katherine Crane, Erin Healy, Danielle Kelley, Jessica Piracini, Adrieana Rossini. Austin Prep: Michaela Boyle, Jaimee Cooke, Caty Flagg, Maddy Ricci. St. Mary’s: Amanda Donahoe, Tatiana Doucette, Lauren Skinnion. Catholic Conference — Fontbonne: Madison Devine, Shannon McIsaac, Katherine Nolan, Noelle Sass. Notre Dame (Hingham): Bridget Dilworth, Caroline Hocking, Haley Marshall. Ursuline: Ivory Hestmark, Corrine McCool, Maeve Mognihan. EIL — Berwick: Julia Mini, Gabby Wigin, Kaitlyn Wurzer. Dana Hall: Jenny Barrack. Newton Country Day: Emily Hession, Caitlin Stadtler, Charlotte Welch. Pingree: Leah Heinze, Katie Shreenan, Jillian Witwicki. Portsmouth Abbey: Sally Hoerr, Maddy McCann. Winsor: Rachel Scholz-Bright. ISL — Brooks: Isabella Papapetros. BB&N: Katie Burt, Cara Najjar. Governor’s Academy: Maggie Salmon. Middlesex: Leah Olson, Madeleine Winslow. Nobles: Brigit Bergin, Lexie Laing, Haley Mullins, Mallory Souliotis. Rivers: Ellie DeCaprio, Melissa Maffeo, Alice Pigeon, Clara Pigeon. St. George’s: Andie Plumeri. St. Mark’s: Kearan Burke, Sophia Millerick, Kara Violette. St. Paul’s: Brooke Avery, Caitrin Lonergan, Shayna Tomlinson. Thayer: Julianne Landry. Merrimack Valley/Dual County — Acton-Boxborough: Megan Barrett, Leah Cardarelli, Kaitlin Hoang, Olivia Keefe, Annie Messuri. Andover: Veronica Alois, Caroline Hughes, Jacqueline Leone. Billerica: Kelly Broderick, Amanda Burns. Chelmsford: Rachael Bossi, Jillianne Sheehan. Concord-Carlisle: Carmen Braceras. Haverhill: Alex Casale. Lincoln-Sudbury: Sarah Provost. Methuen: Amanda Conway Tewksbury: , Amanda Conway, Kelly Golini, Taylor Lirakis. Waltham: Karly Aguire, Zena Casteel, Taylor Scafidi. Wayland: Gianna Fargnoli, Morgan Griffen. Westford: Sarah Lizotte, Lindsay MacDonald. Middlesex — Arlington: Meredith Gallagher. Burlington: Kelly Browne, Kelsey Ryan, Cassidy Smith, Krista Toscano. Melrose: Haley Gorman, Anna Kleis. Reading: Tori Grimmer, Ali O’Leary, Caroline Seibold, Kayla St. Pierre. Wakefield: Melanie Mansfield. Watertown: Kendall Brown, Emily Loprete. Wilmington: Lauren Fitch. Winchester: Alaina Ewing, Jena Pantano. Woburn: Courtney Davis, Emily Lissner, Ashley Moran. Northeastern — Beverly: Caitlin McBride, Nicole Woods. Cambridge: Kellie Hagerty. Marblehead: Caroline Hughes, Brittany Smith. Masconomet: Lily Dow, Jensena Moner. Medford: Brittani Lanzilli, Adrianne Porrazzo, Marissa Williams. Lynnfield: Lauren Hennessey, Sophia Post Peabody: , Courtney Smith. Winthrop: Gretchen Howard, Katie Jeter, Caroline McKinnon, Catherine Salvetti. SEMGHL — Barnstable: Kylie Hallan, Lindsey Phelan, Morgan Richard, Olivia Sollows. Bishop Stang: Kyleigh Good. Wareham: Shayna Santiago, Ariel St. Germaine, Brittny St. Germaine. Canton: Jill Eckler. Nauset: Brianna Cowing. Dennis-Yarmouth: Jess Benoit, Kristina Cheverie, Michaela Donahue, Katie Donohue. Dover-Sherborn: Sophie Grossbaum, Talia Grossbaum. Duxbury: Payton Donato, Jane Dudley, Marissa Fichter, Ally Hammel, Rachel Myette. Falmouth: Kelly Ferreira, Maddi Haberl, Madison Scavotto, Alexa Scribner. Franklin: Allison Burke, Mary Kate Drinkwater, Alex Mitchell. Cohasset: Valerie Farren, Shea Kearney, Ari Soldano. Hingham: Catherine Linehan, Tori Messina. King Philip: Haley Anchuckaitis, Danielle Hamilton. Latin Academy: Danielle Baldasarri, Kathleen Torpey. Oliver Ames: Katelynn Arnold, Taylor Brown, Jamie Gotwald. Marshfield: Elle Everett, Jessy Spitz, Molly Sullivan. Martha’s Vineyard: Aubrey Ashmun, Sydney Davies, Callie Jackson, Olivia Ogden. Medfield: Lindsay Brown, Jesse O’Loughlin. Medway: Melissa Alexander, Kerryann Goode, Katie Peters, Maeghan Vasile. North Quincy: Julia Donovan. Norwell: Lilly Cleary, Caroline Nichols. Sandwich: Claire Gauthier, Maggie Layo. Scituate: Hannah Clougherty, Chloe Ewanouski, Oriana McDonough, Corey Murray. Westwood: Siobhan Burke, Kim Egizi, Kelly Healey, Lauren White. Pembroke: Jacki Dipietro, Jess Govoni, Jane Morrisette Whitman-Hanson: , Mel McAleer.